For many newcomers to Canada, building a life in a new country is full of anticipation and opportunity, but also challenge and obstacle. For immigrants who left behind an established life in their home country, starting from scratch can be daunting: learning a new language, understanding a new workplace culture, building a community, and searching for employment. The list is long. In her home country of Vietnam, Diep Nguyen had a career she loved. She worked for the federal government in the Ministry of Health, a job she worked hard to achieve. For many newcomers to Canada, building a life in a new country is full of anticipation and opportunity, but also challenge and obstacle. For immigrants who left behind an established life in their home country, starting from scratch can be daunting: learning a new language, understanding a new workplace culture, building a community, and searching for employment. 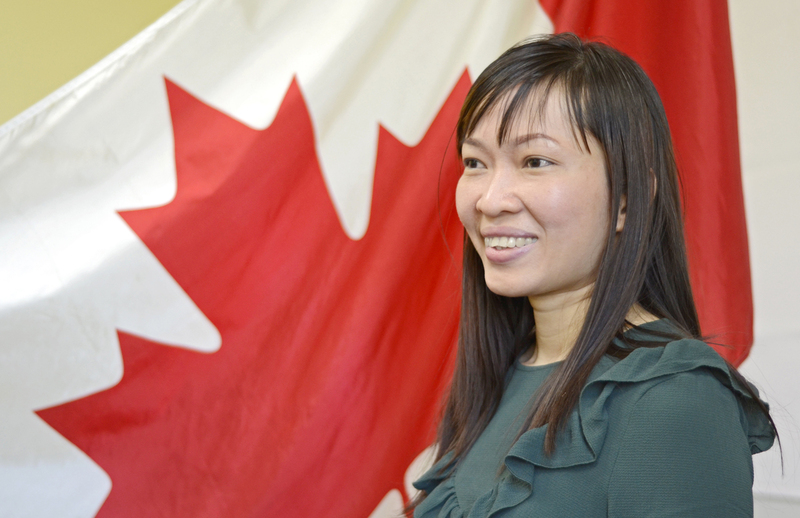 Diep Nguyen poses in front of the Canadian flag after receiving notice she has been accepted as a Canadian citizen. “I had to leave it to come here and start over,” she said, a choice she made very carefully. Her motivation? Love. She decided to join her partner in Canada, where he was settled in his career. They met in Vietnam, but he invited her to join him in Canada – a land of opportunity. Learning a new language was the first thing on her agenda, which brought her through the doors of IWC in 2009. “IWC is very helpful for newcomers”, she continued. Most recently, Diep graduated from the WorkLINC program, which will help to launch a career in the food industry in Hamilton. She is now certified in Food Handling, WHMIS, and Health & Safety. At the Immigrants Working Centre, Diep graduated from the WorkLINC program, which prepared her for a career in the food industry. “I would like to work at the restaurant, or the Farmer’s Market, or a bakery,” she explained. Diep has just passed her Citizenship Test and will soon become a Canadian Citizen, once she receives notification of her ceremony date. Her five-year plan is simple – get a job, take care of her family, and help her son become successful in Canada. Diep stands as her classmates congratulate her with applause for being accepted as a Canadian citizen.